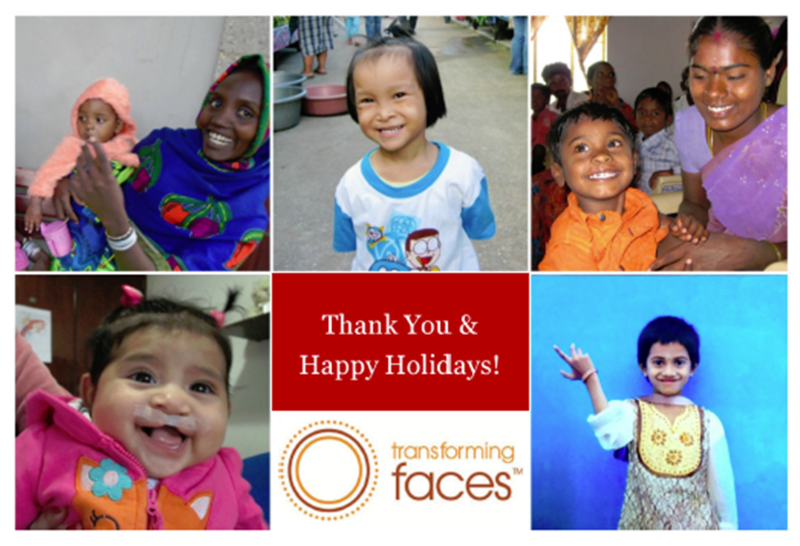 Please note, the Transforming Faces office will be closed for the holidays between Monday December 21,2015 and Friday January 1, 2016. To reach us, please leave a voicemail at 416-222-6581 and someone will get back to you as soon as possible. We will re-open on Monday January 4, 2016 at 9am. Interested in making a holiday donation? If would like to make a donation to support cleft lip and palate care during the office closure dates, please click here or use the mailing address listed below. Note that 100% of your donation will go directly to our programs and donations of $200 or more will be matched by a private foundation. Donations received on or before December 31, 2015 will be eligible for a 2015 tax receipt. Thank you for making this year such a success. We look forward to sharing results with you over the coming weeks. Wishing you and your families a very Happy Holidays and Happy New Year!